Chicken wings are pretty much the ultimate party food, game food and appetizer. I've always liked ordering them in restaurants, but never really considered making them at home until I came across this yummo recipe. I found it over on allrecipes.com, which is one of my favorite recipe sites. The ingredients list seemed simple enough so I though I'd give them a shot. If you have a small home fryer you could always fry the wings like the restaurants do, but who would want to do that when you can BAKE them! Less grease is always a good thing in my opinion, especially when you don't have to sacrifice texture or taste. These wings manage to come out nice and crispy by placing them under the broiler before serving. Now, as far as what dip to serve with the wings, I'm not a fan of blue cheese (I just can't seem to bring myself to like cheese that has turned blue), which is the traditional dip for the chicken wing. 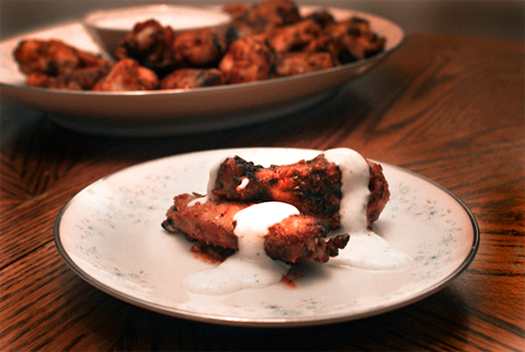 I've included my favorite ranch recipe that compliments the wings perfectly. I always make a big batch of the ranch and use the leftovers on salads or to dip fresh veggies. Try these chicken wings and I think you'll agree, they're tangy, tasty and finger-licking good! Follow directions on your bag of chicken wings for cooking instructions. The time will vary depending on whether you are starting with frozen wings or thawed. Bake wings until cooked through and crispy. Meanwhile, in a small bowl combine butter, red pepper sauce, tomato sauce, chili powder and cayenne pepper. For the ranch, combine all ingredients in a small bowl. Refrigerate for at least a half hour to allow flavors to blend.